For the past three years HCCs have hosted Back-2-School special outreach events within our communities. This year is no different. With the school year starting in the Valley very soon, having school readiness items for kids is critical to being 100% prepared to start the school year off with a bang! Kids from the local community are invited into the HCCs to pick out their favorite, brand-new school backpack for the upcoming school year. Kids are so excited to then fill their backpack with school supplies according to their grade level. Parents and grandparents take a back seat on this one and watch as the kids get to ‘go shopping’! After a child is done shopping they wear that backpack out the door, as many times this is the first time they have had a brand-new backpack to be proud of. 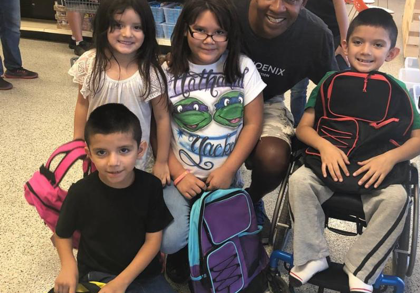 135 kids in 2 ½ hours were served on the first day of backpack giveaways at HCC Phoenix! “It was crazy, the line of kids wrapped around our building!” commented Adrie Olson, HCC Phoenix Director. As of the first of August HCCs, have assisted over 400 kids in getting all the supplies needed to kick off the school year. Stay tuned, we’re still shopping with kids and will have final numbers next month! Thank you to our many partners who gave generously to make this fourth annual backpack and school supply giveaway a success, as well as Adrie Olson and her Advisory Team for encouraging families, local businesses and churches to be a part.